ACT Policing would like to congratulate Lyn Woodward on being awarded the ACT Neighbourhood Watch (NHW) Member of the Year for 2018. Lyn is the Bonython Newsletter Editor, collecting and delivering editions to other distributors and local members. President of ACT NHW Margaret Pearson said Lyn is an invaluable helper; often managing NHW issues and stepping up to facilitate residents meetings when the Area Coordinator is unavailable. “She is a marvellous advocate for NHW; spreading the word to many through her other varied activities like clogging, Family History group and other Tuggeranong ‘55 Plus Club’ events. “She is the person who ‘walks the walk and talks the talk’ for anything involved with NHW in her area. 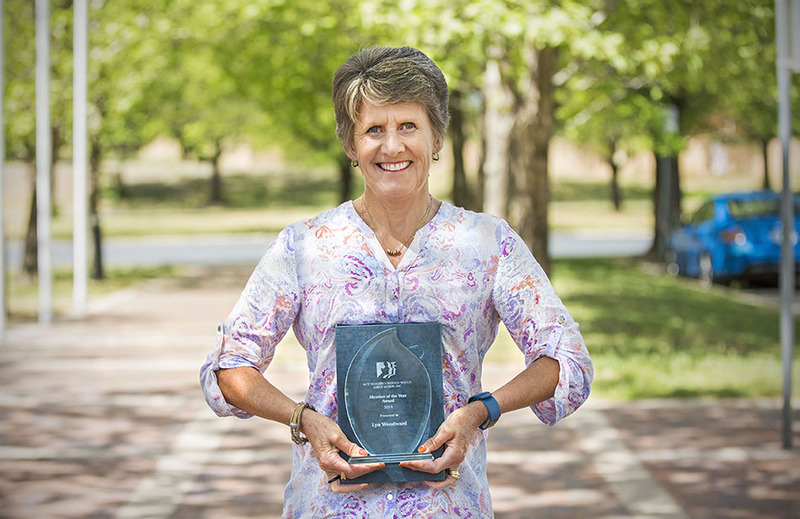 “Lyn was nominated for the award to acknowledge her contribution and dedication, and recognise her worth for all that volunteers and NHW stand for in our local community,” Ms Pearson said. When we caught up with Lyn, she was a bit overwhelmed by the award. “Honestly, It’s very humbling to be recognised for doing something that comes naturally in your suburb,” she said. Acting Superintendent Intelligence and Community Safety, Kylie Lawson said it’s people like Lyn who bring neighbours together.